Finding the lowest grade Morgan Dollar! Everyone collects Morgan Silver Dollars for different reasons. Some want to collect every year or a certain mint; for instance they want every year the Morgan was minted in Philadelphia. We all have our personal reasons for collecting our own way. When you go into a coin store or shop on line there is always low grade Morgan dollars selling for a reasonable price. Don't over look them... They have a history all to themselves. These coins were loved until their edges felt smooth. They have a worn look of a coin mingling with other coins in someones pocket, it feels old and smooth. The history of someone walking around in the 1800's with your exact coin in the pocket is pretty interesting! You don't have to worry about touching it with your fingers or rubbing a smudge of dirt off with your finger. You can keep one in your pocket for good luck use it as a fill in coin until you find your specific 1885 Morgan Dollar you've been looking for your entire life. They also make great gifts. What kid wouldn't want a silver dollar for Christmas actually what adult wouldn't want a silver dollar for Christmas! For the Morgan Dollar Fan! We are all here because we love to collect Morgan Dollars. We all have our own personal reasons for being a fan of the Morgan Silver Dollar. And of course we all have our own personal way we like to collect our Morgan Silver Dollars. Perhaps you collect only by the year and disregard where your Morgan was minted. In that case you're probably on your way to fulfilling your goal. Another way you might collect Morgan Dollars is by year and where each coin was minted. Maybe you just have a pile of Morgan Dollars and could care less when and where they were minted you just like to own them which is awesome! There is no wrong way to collect Morgan Dollars. 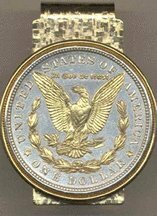 There are even collectors who might want this reverse Money Clip Morgan Dollar. List price is $178.95, but today it's on sale for only $165.18! No two collectors are alike, but what we all enjoy is our Morgan Dollars! This real U.S. coin is first layered in pure bright silver. Then, by hand, the figure is highlighted and brought to life with rich, pure 24K gold. This breathtaking and exclusive work turns the coin into a stunning and true work of art. Each coin is hermetically sealed against wear in a clear, hard acrylic coating. It is then mounted in a patented hinged clip and placed in a jewelry box. It says Jewelers Eye Loupe, but it would make a great coin magnifying glass to keep in your pocket. It's small compact and priced extremely well! The list price is $13.50, but it's on sale for only $7.25 that is a 46% savings. Plus it ships for FREE with Super Saver Shipping! This is an affordable way to inspect your Morgan Dollars! If you are in the market for a magnifying glass you also might want to check out the SE mini 45x Brass microscope with illuminator or the SE 30X illuminated jewelers loupe. Lots of great choices for extremely low prices! Since they are so affordable you can keep one in your car one in your kitchen drawer. You can get a few so you never have to go looking for a magnifying glass again! The complete set is great for rock collectors, coin collectors, hobbyists, jewelers and anyone else who requires distortion free magnification. What are the most prominent doubled dies? In 1854 the San Francisco Mint opened to serve gold mines during the California gold Rush. The California Gold rush started in 1848 when James W. Marshall found gold at Sutter's Mill in Coloma, California. During that time around 300,000 folks came to California in search of gold, and they weren't all from America people from as far as china, Australia, Europe and Latin America were making their way to California to strike it rich. It didn't take long for the San Francisco Mint to outgrow their first building and need to move into a new one. In 1874 they did just that. This building was call "Old United States Mint" or "The Granite Lady". They built it with a concrete and granite foundation to ensure no one could tunnel into the vaults. This proved to be helpful during the 1906 San Francisco earthquake the Old United States Mint because it stayed standing. There was some $300 million in the vaults at the time a third of the United States' gold reserves. The Old United States Mint was open until 1937 when the present day San Francisco mint was opened. In 1961 the Old United States Mint was designated as a National Historic Landmark. San Francisco Mint minted Morgan Silver Dollars from 1878-1904 + 192. You can tell if you have a San Francisco minted Morgan Dollar by looking at the reverse side of the Morgan Dollar. Directly about the D and the O you will the the letter S that stands for San Francisco Mint. Liberty Head V nickel (1883-1913)Officially the US mint only minted the Liberty Head V nickel until 1912. There are 5 known genuine examples of the 1913 V Nickel that was produced illegally. They don't know how many were actually produced.Of course since there are only 5 in existence they are extremely valuable! The original 1883 V Nickel didn't have the word "cents" on the reverse. U.Sand Canadian railroads institute 5 standard continental time zones, which ended the confusion for thousands of local times. Hong Kong Observatory is opened. The Observatory forecasts weather and issues warning on the weather-related hazard.